8th March 2017. 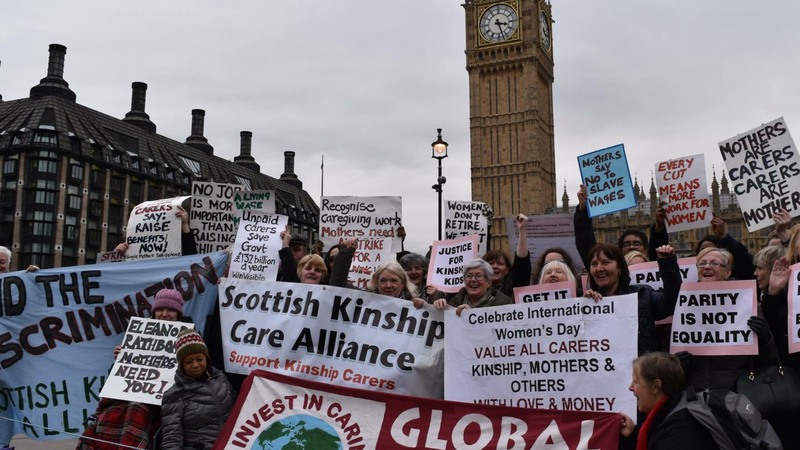 Members of the Scottish Kinship Care Alliance today joined groups of women from all over Britain to celebrate International Women’s Day and fight for women’s rights as carers, mothers and equals. Parallel protests happened in more than 50 countries globally addressing women’s rights and striking from home and workplace duties. 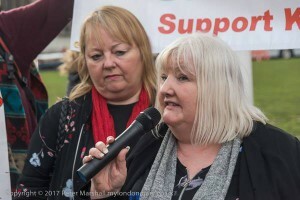 The London event was organised by the Alliance’s close allies – Global Women’s Strike – alongside a variety of other groups including WASPI – Women Against State Pension Inequality, who made the long journey from Scotland. 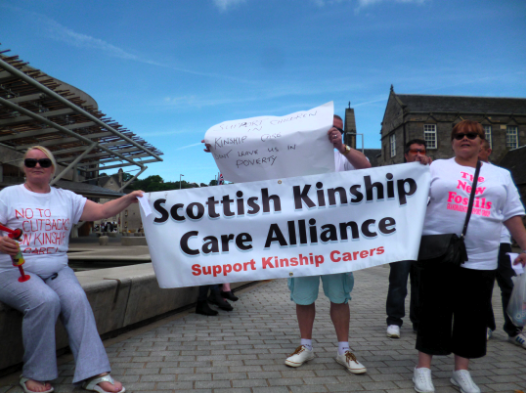 Kinship care once again became a key issue as three SNP MPs joined the protest and stood with the kinship carers. Chair of the Alliance Micheliene Kane spoke to the large audience outside the Houses of Parliament highlighting the continuing disparity between formal and informal children in kinship care, despite the increase in support which carers have recently received after years of campaigning. This entry was posted in Uncategorized on April 28, 2017 by Miriam Rose. 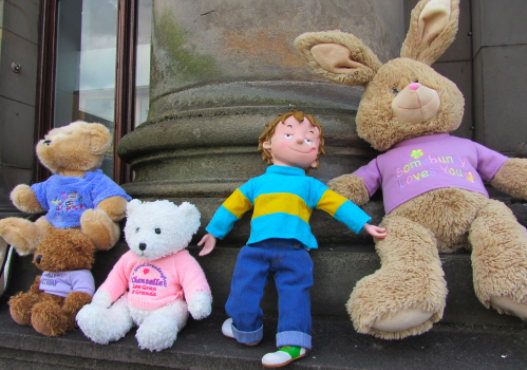 Please join our national demonstration at the Scottish Parliament from 12 – 2pm on 19th February 2014, to catch MSPs before they go into parliament for the Stage 3 debate on the Children and Young People Bill!! Bring placards and loud voices. 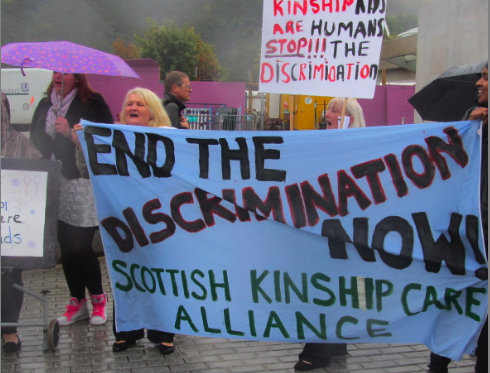 This is one of our last chances to stop support being reduced as part of this Bill. Also please sign our petition and/or cut and paste the letter below to send to your MSP. You can find your MSP and email them using this link, and then copying the letter below into the text box, with any alternations you want to make. Please send this to all your friends. We need as many letters and signatures as possible before the 19th Feb.
Read below to find out why this is so important.. This entry was posted in Uncategorized on February 7, 2014 by Miriam Rose. MLAs in the Northern Ireland parliament heard a plea for kinship carers to receive the same same support and allowances provided for foster parents, on 17 April 2012. The DUP’s Michelle McIlveen explained that one third of looked-after children in Northern Ireland lived in kinship care arrangements. 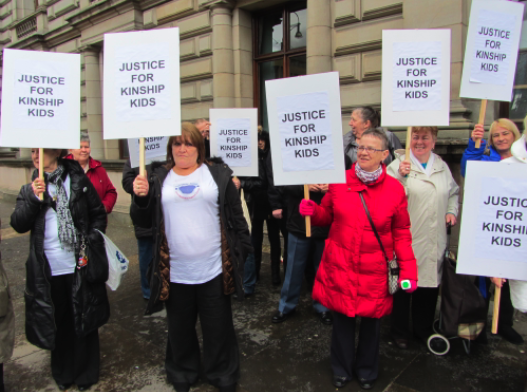 Sue Ramsey, chairperson of the health committee, said family members became kinship carers because their instincts told them it was better for the child not to be taken into the care of the social services. These were often casual arrangements, she added. The vast majority of kinship carers were unlikely to come into contact with the social services and were not receiving the support they required. This was partly due to fear, Ms Ramsey explained, citing an example where social services threatened to remove a number of children because their carers had not bought a fireguard. This entry was posted in Uncategorized on July 31, 2012 by kinshipjustice.